Tomorrow I’m hoping on a flight and headed back to Illinois to be with friends and family for my baby shower. Time has flown by and it feels a bit surreal that we’re only about 12 weeks out. I’ve had my head in learning mode- reading books, planning the nursery, and overall nesting (aka: organizing the entire house). All of this, on top of work, has created this sort of strange environment where I kind of forget about about other exciting things that are happening between now and then, like the new book (you can also read a bit more about it here and check out one of the other recipes)! Preheat the oven to 425˚. Slice the skin off the grapefruit and cut into slices. Place in a roasting pan and sprinkle with the sucanat. Bake for 15 to 20 minutes, until the sugar has caramelized and is lightly browned. Preheat the waffle iron. In a bowl, whisk together the flour, cornmeal, baking powder, and sea salt. In a separate bowl, whisk together the milk, eggs, melted butter, maple syrup, and vanilla extract. Pour the wet ingredients into the dry and stir until combined but with a few lumps, being careful not to overmix. Pour a quarter of the batter into the waffle iron and cook per the waffle iron directions. Keep finished waffles on a baking tray in a 200 ̊F (93 ̊C) oven until ready to serve. 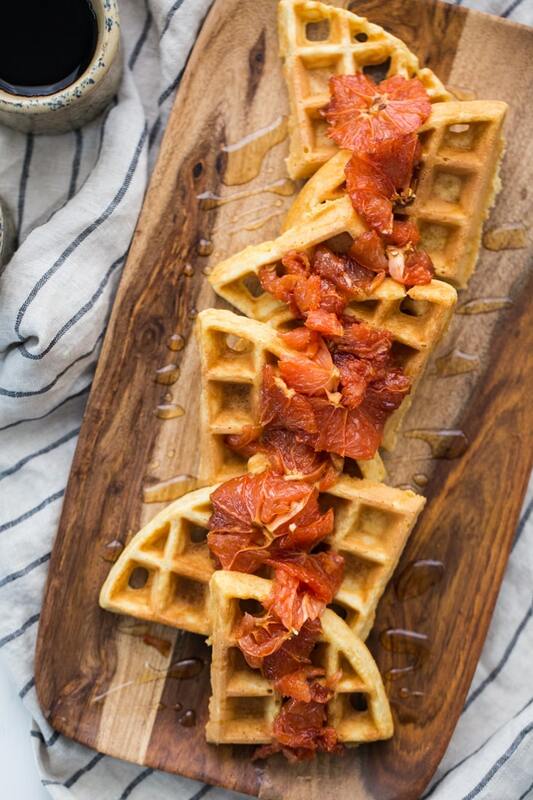 Serve topped with roasted grapefruit and maple syrup. You are really, really making me want to get a waffle iron! These look so great – and I’ve never thought of baking grapefruit before. Hope you have a good journey tomorrow! Does this work with coconut flour or brown rice flour? Thanks! Hi Cassie, I’ve not tried it with those flours straight but made it with a gluten-free all purpose mix which worked out great! This is the perfect weekend breakfast because they’re easy but also special with the grapefruit topping. I may just have to make these this weekend! I am on a grapefruit binge right now, but never thought to roast them. Thanks for the inspiration Erin! I love that you left the grapefruit in whole slices and roasted them. Makes for a unique and pretty presentation! Erin! This looks so good! I hope you have a wonderful time at your baby shower, and how exciting to know that in 12 weeks you’ll have a little one in your world! Everything about this is perfect. 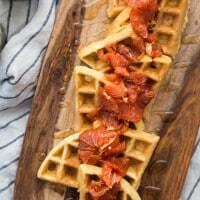 The texture of the cornmeal and tart flavor from the grapefruit…these waffles are everything! Roasting the grapefruit can really do wonders for the dish and your health. Great recipe! The recipe looks delicious. Have a great time visiting with friends and family at your baby shower. We made these waffles for the family today and everyone loved them! From the two- year old to the grandpa. They were easy to put together ( good because we had to make another batch pronto to keep production humming) and the recipe accommodated soy milk instead of whole dairy. Tasty and great texture from the cornmeal. So glad this recipe is in your cookbook and it’s coming soon! What gorgeous meal to have for breakfast! 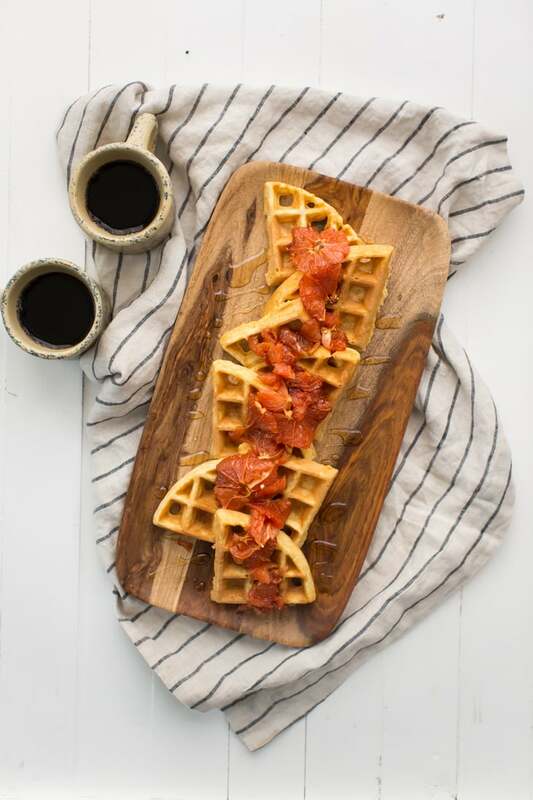 These waffles looks amazing, Erin! Roasted grapefruit surely made it delicious! I would love to have these for breakfast.